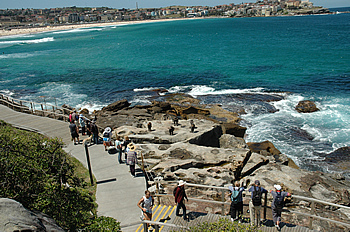 Sculpture at the water's edge overlooking Bondi Beach. Watching surfers ride the waves from the terrace of Icebergs, a hip restaurant overlooking Bondi Beach, it seems incredible that Sydney's tropical environment - known for its laid-back surfer culture - would also nurture a serious arts scene. 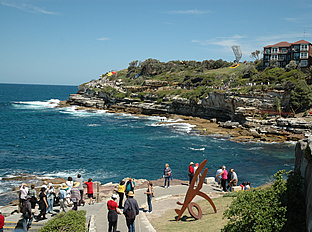 Yet, looking down to the coastal path that winds from Bondi to the Beach at Tamarama then up the rugged cliff to Bronte Beach, the series of artists' sculptures scattered along the water's edge speaks volumes about the city's growing sophistication in the arts. For an arts buff, it seemed like auspicious timing to be in Sydney as it celebrated its annual Sculpture by the Sea Festival (www.sculpturebythesea.com). Throughout the three-week event, viewers can stroll a scenic coastal path and discover more than 100 different sculptural installations. The festival's 10th anniversary this past November included monumental works by Aussie sculptors Jarrod Taylor and Angus Adameitis, as well as intriguing offerings by renowned and emerging artists from around the world. Aborginal artist, John Colquhoun, represents artists at Bandigan Gallery in Sydney. Having decided on this, my fifth visit to Sydney, to focus entirely on its art scene, I enlisted the expert help of Russell Storer, curator at Sydney's Museum of Contemporary Art (140 George Street, The Rocks, Sydney; www.mca.com.au), and Leo Schofield, a leading figure in the arts in Australia. Over drinks at the cheerful Lotus Bar & Bistro, the energetic septuagenarian Schofield - who has organized several international arts festivals in Melbourne and Sydney, including the 2000 Sydney Olympic Arts Festival, and has written weekly columns in the Sydney Morning Herald and later the Sunday Telegraph - regaled me with stories of how he'd watched Sydney "grow from a dull place in the '60s to a nice parochial town to a glowing metropolis…a most curious city with an intensity of life that almost parallels Rio as a major metropolis that is a huge centre for business and commerce, yet at the same time, a beach resort." Joking that typical young business types sport a briefcase in one hand and a Speedo swimsuit in the other, Schofield says, "Sydney is a dichotomous city, but it has a buzz, a vibe that has become a magnet for creative people from around the world." Russell Storer echoed this thought later, as he explained that international attention for Sydney's art scene started growing with the city's first Biennale (a bi-annual art fair) in 1973. "Prior to that, international art wasn't that available in Sydney, and there was little appreciation for work on a distant island separated by oceans," he told me. "But each successive Biennale, driven each time by an international curator with a singular vision, encouraged a strong interest in contemporary art here and brought critical acclaim from art critics around the world for our own artists as well." Internationally recognized today, Sydney's contemporary art scene is dynamic and covers a range of different types of art, with a wave of interesting Australian artists appearing over the last 10 years, Storer explained. For example, in the avant-garde world, video artist Shaun Gladwell has gained international acclaim, and the Kingpins - a collective of four women who typically dress in men's outfits to make video and performance art - were invited to exhibit in England. Storer believes that the visual arts scene is rich with wonderful talent worth seeking out. He points to Dale Frank, who "paints in a grunge post-pop style with a playful political edge." Interestingly, like Griggs, many of Australia's most influential artists produce works with a political edge. Chilean-born Juan Davila, who moved to Australia in 1974 and whose work is represented in major collections across Australia as well as New York's Metropolitan Museum of Art, produces complex painting with social commentaries. Recently, for example, Davila produced a critically acclaimed series of nightmarish landscapes that addressed the treatment of refugees in Australian detention centres. A scene of The Dreamings depicted on an animal horn. Of course, one cannot discuss Sydney's art scene without acknowledging the significance of its Aboriginal artists. Now in his early '80s, Paddy Bedford is one of Australia's most respected Aboriginal artists and one of only eight indigenous artists selected to create a site-specific work for the new Musée du quai Branly in Paris. Bedford paints stories symbolic of the "Dreamings" of his life. As Storer took the time to explain to me, on order to appreciate Aboriginal art as a rich and complex narrative that is integrated with the artist's relationship to the land, it's essential to understand the concept of Dreaming. Dreaming is how Australia's Aborigines perceive the spiritual, natural and moral order of the cosmos. For instance, there are Dreamings that recount how Rainbow Serpents and Lightning Men traversed the globe, creating everything in it and establishing the laws of society. According to Aboriginal belief, the continent of Australia is laced with Dreamings, some linked to a specific place and some that travel from place to place. Storer points out that the Aborigines only began painting on a canvas in the 1970s. While Aboriginal art in Australia dates back at least 50 millennia, the ephemeral nature of the earliest works - mostly engraved or painted on rocks scattered across the country - makes it tricky to calculate just how long ago such works were produced. Experts figure that paintings in the Arnhem Land escarpment, in Australia's tropical north, are 50,000 years old, pre-dating the Paleolithic rock paintings in Europe. The engravings found in South Australia likely date back 30,000 years. One fact is certain: the artistic flair cultivated over time served utilitarian, didactic and socio-political purposes for an isolated people. Art is how the Aborigines expressed their individual and group identities, their joys and hardships and their relationships to the land, as well as their Dreamings. With Storer's remarkable insight, I proceeded to visit several of Sydney's outstanding public galleries. The Art Gallery of New South Wales (Art Gallery road, The Domain, Sydney; www.artgallery.nsw.gov.au) is well respected for its significant collections of Asian art, Australian art from the colonial era to the mid-20th century, and remarkable ethnographic and archeological artifacts. To find the most interesting private galleries, I explored the district of Paddington, about a 15-minute bus or cab ride from Circular Quay. Home to some 50 art galleries, Paddington itself is a beautiful Victorian enclave where many of its distinct terrace houses decorated with lacy wrought iron have been turned into boutiques and galleries. Galleries not to be missed include the Roslyn Oxley9 Gallery (8 Soudan Lane; tel:011-61-2-9331-1919; www.roslynoxley9.com.au), Kaliman Gallery (56 Sutherland Street; tel:011-61-2-2273; www.kalimangallery.com), Sherman Galleries (16-20 Goodhope Street; tel:011-61-2-9331-1112; www.shermangalleries.com.au) and Utopia Art Sydney (2 Dank Street; tel:001-61-2-9699-2900;), which has excellent Aboriginal art. At Darling Harbour, I browsed through the Gavala Aboriginal Art & Cultural Centre (www.gavala.com.au), Sydney's only Aboriginal-owned and - operated cultural centre. It has a fine art gallery as well as a retail shop and is a good spot to look for authentic, reasonably-priced souvenirs. 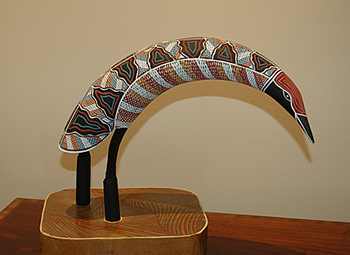 Many visitors to Australia want a piece of Aboriginal crafts to call their own, but aren't able to bring home museum-quality works. On Saturdays and Sundays in the Rocks district - which is chock-a-block with craft stores, galleries, pubs and eateries - the Rocks Market (www.therocks.com) overflows with 145 stalls. Scattered among the touristy kitsch are good Aboriginal artists selling hand-painted canvases as well as didgeridoos (instruments made from hollowed trees). 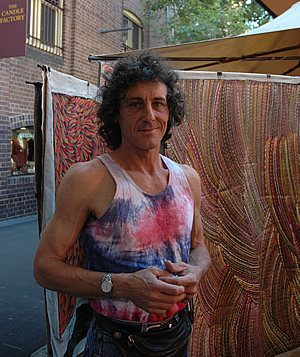 Among the best is John Colquhoun, artist/owner of Bandigan Art (www.bandigan.com), based in Woollahra. His spectacular canvases, culled from Aborigines across Australia, run from $90 to around $1800. After days of looking at the myriad works of art - particularly examining the Aboriginal paintings, with their brilliant strokes, dots and shapes meandering across canvases - I began to see each piece as a magic carpet that links the individual artist's present with his past or future, and his human spirit to the supernatural. And I became captivated by Dreaming. A backstage tour of the Sydney Opera House (www.sydneyoperahouse.com) gives spectacular insight into the globally recognized icon by Danish architect John Utzon. Not for the physically challenged, this intimate guide tour takes you into the concert halls, the conductor's private suites, the ballet rehearsal hall, and up and down stairs, as you explore the stage, the lighting rafters, scenery docks and orchestra pit. The tour ends in the Green Room with a full breakfast just as the musicians, actors and dancers arrive for their morning sustenance. $130 including breakfast. After an insider's look, get a romantic view of the opera house and the Sydney bridge by reserving a spot at Aqua Dining (www.aquadining.com.au). For art lovers, the art- and antique-filled Observatory Hotel (tel:011-61-2-9256-2222; www.orient-express.com), situated on a quiet street in the historic Rocks District, is a treat. Luxury and impeccable service abounds in this Orient-Express establishment, which has an indoor swimming pool and full-service spa. For a culinary and wine experience surrounded by original art, head to Galileo, their multi-award-winning restaurant. Art Almanac (www.art-almanac.com.au) is an essential guide to Australia's art galleries. Published monthly, it's illustrated with current exhibitions of contemporary and Aboriginal works and is available at galleries and bookstores for $3. Aboriginal Art by Wally Caruna, in the "World of Art" series by W.W. Norton, is a magnificently illustrated book that gives a comprehensive understanding of the aboriginal art scene. It is available at most major bookstores. For the least amount of stops and transfers en route to Australia, fly Air Tahiti Nui (tel:877-824-4846; www.airtahitinui-usa.com) non-stop from New York to Tahiti, and then on to Sydney.